Case study – creating photos of faces and facial expressions as training data for a face recognition software. Thousands of Clickworkers from all over the world take photos of their faces with different facial expressions and from various perspectives. This way, they provide the software developer with important face recognition training data that is used to train the system. The 2- and 3-dimensional automated facial recognition techniques find more and more application possibilities. Aside from their original purpose ¬– which is the identification or verification of persons in the safety and criminal-law domain – numerous fields of application have been added in the economic and research industries. With the help of facial recognition, robots can, for example, recognize human emotions and react accordingly. Online shops selling glasses can offer suitable frames for every user through facial recognition and the clients can virtually try them on. Through automated facial recognition, person-specific styling as well as make-up tips can be given online and new stylings can be visualized. A high-quality face recognition software should be able to read and track the history of every face effectively. The biometrics of faces, however, differ from person to person. In addition, as soon as a person presents emotional expressions and/or his/her face cannot be seen from the front, the position of his/her mouth, eyes, cheeks, etc. changes. The software should be adapted to each of these features. To develop such a system, it has to be intensively trained with numerous and varied photos of faces. This is where our face recognition training data comes in. Thousands of Clickworkers from various countries and regions create photos of their faces. 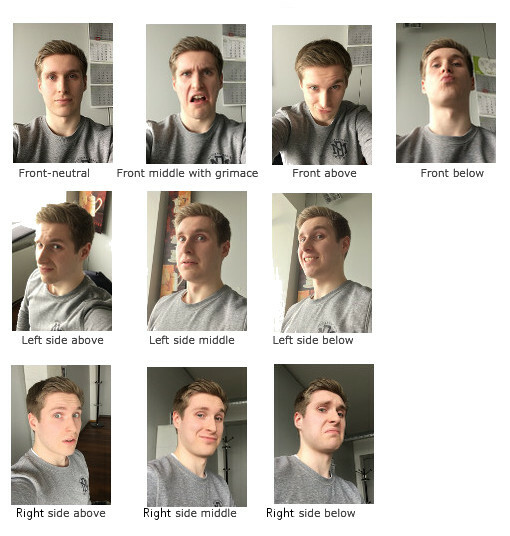 According to instructions, each Clickworker photographs his/her own face ten times, once head-on and with a neutral facial expression and nine times from different perspectives and with various facial expressions (e.g. anxious, doubtful, angry, laughing, smiling, annoyed, sad, helpless, sulking, or pulling a grimace). The Clickworkers upload their photos to the platform, stating the respective perspectives and the various facial expressions. Then, the quality management team from clickworker checks all the photographs and their specifications. All correct results are transferred to the customer via an API connection. After a short period of time, he receives high-quality photos in a very efficient manner. Using these photos, the manufacturer can train the software for facial recognition, optimize it, and specialize the system for different tasks. The project is discussed with the customer. The resulting tasks are defined and presented to Clickworkers during a briefing. clickworker starts the project and places the tasks for photo creation as individual jobs on the clickworker web platform. Numerous Clickworkers from the defined countries accept the jobs in parallel, take the pictures and upload them to the clickworker platform with the required information. The quality management team from clickworker checks the photos and verifies their eligibility. All appropriate photos are transmitted to the customer via an API connection. Facial recognition can be used for a variety of applications that can affect our day-to-day life. The first and foremost category is of course security and law enforcement. A face recognition software can be used to identify criminals or match a person’s face to their passport at a border check. Moreover, it is a useful tool to find missing children. By adding their faces to the database, they can be identified more easily. But these are not the only applications. Face recognition also offers great advantages in marketing: By matching faces to customers, they can be targeted in a more personalized way. This means that customers receive advertising that is catered to their person rather than generalized. Another potential field of application is mobile phone security. Face recognition can be used as the unlock feature, making it more difficult for other people to get into someone else’s phone. All these and numerous other areas will continue to be developed and improved in the future. Our face recognition training data services play an important role in that progress.